Back in February, I wrote about meeting the Canadian planemaker, Konrad Sauer, and trying out a plane that he had made. It performed so well and I liked it so much that I immediately asked him to make me one. Here’s a picture of the plane that I tried. He calls it the XS No4, which I imagine is short for extra small – although there may be another more complicated explanation. What attracted me to the plane, apart (obviously) from the fact that it worked so well, was its simplicity. No handle, no adjuster, no cap iron – just a thick blade pitched at 52.5° and a tight mouth. I was delighted to get an email from him a couple of days ago to say that he had started making it. And just to prove it, he attached these photographs. 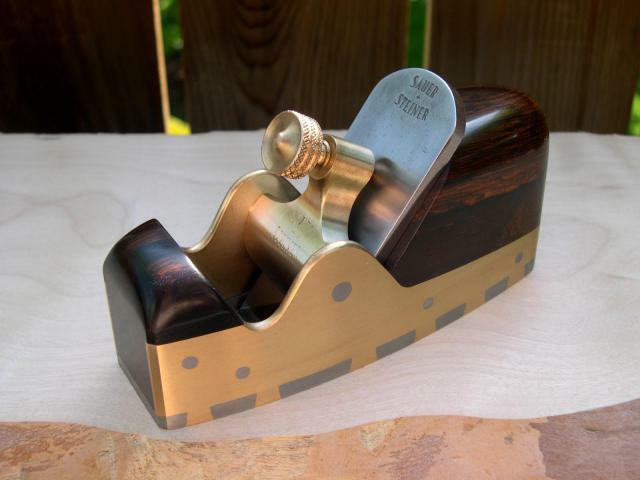 For anyone interested in planes, his website (Sauer and Steiner Toolworks) is a fascinating place to visit. 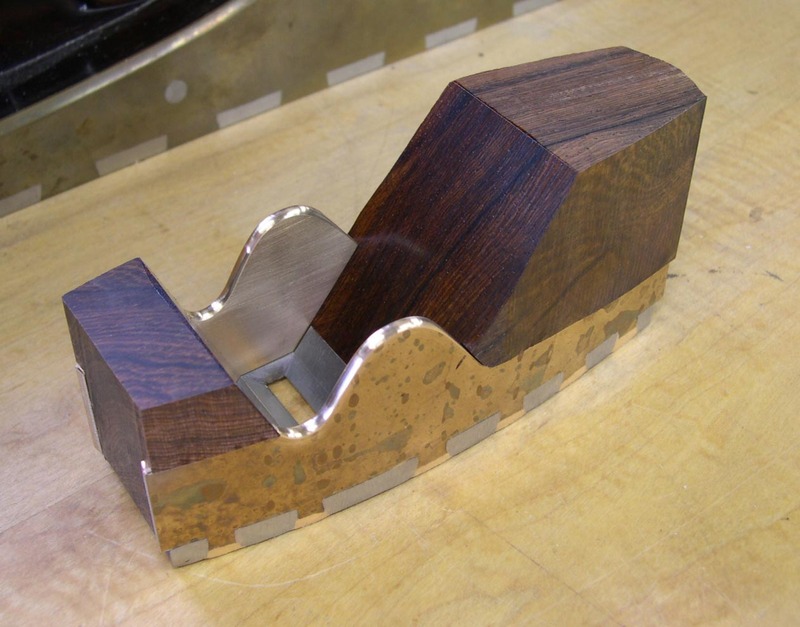 He also writes a blog that is well worth reading – not least for its intelligent comments on making and using hand tools. 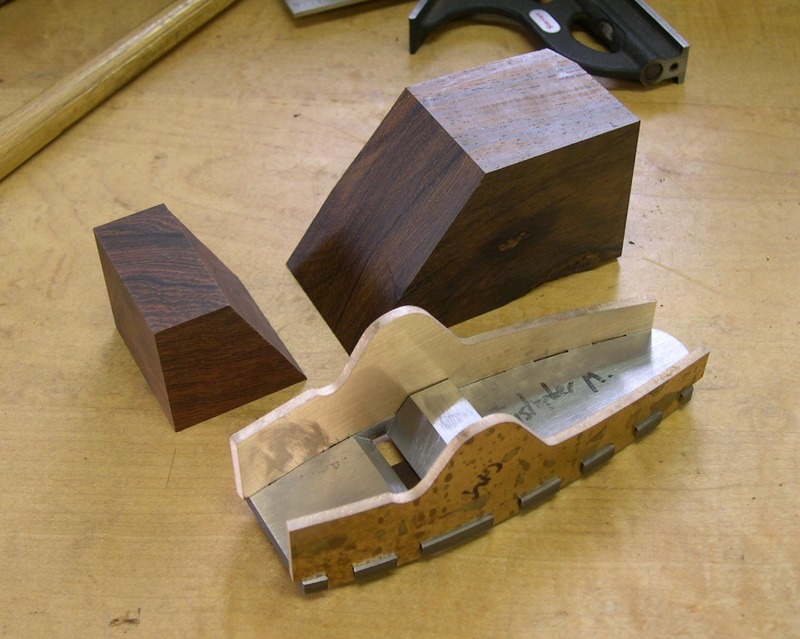 I particularly enjoyed his thoughts on dovetails written when he was in the middle of cutting a stack of them for drawers for cabinets that he was making for his own kitchen. 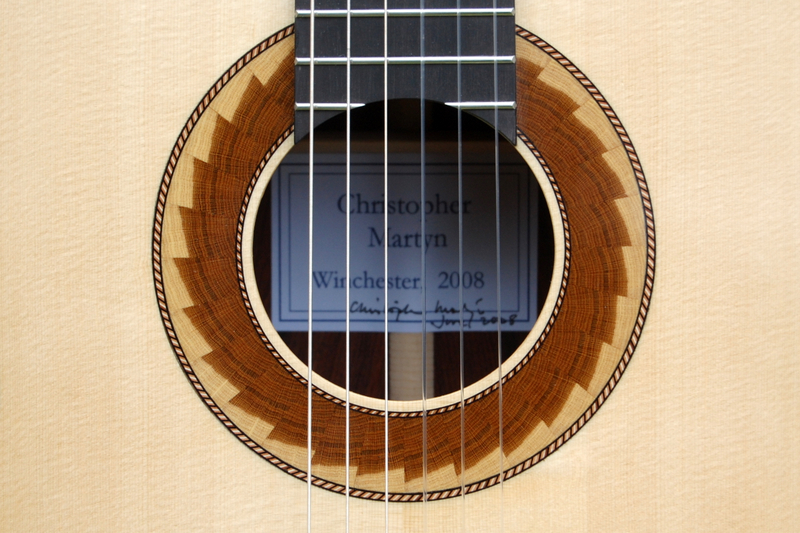 Making guitars means that there are often offcuts of attractively figured wood left over. One thing to do with them is to turn them into musical boxes. 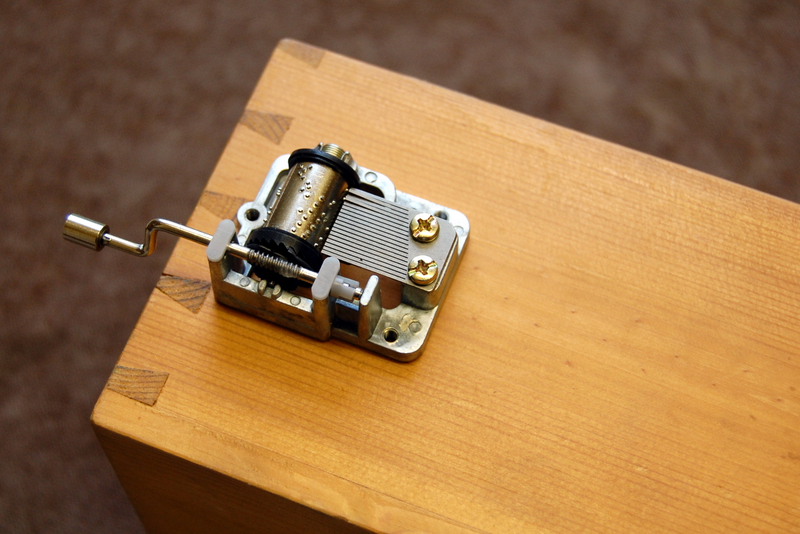 As well as making amusing presents, they demonstrate how even a tiny box and soundboard act to produce a surprisingly loud sound from a mechanism that, on its own, is whisper quiet. 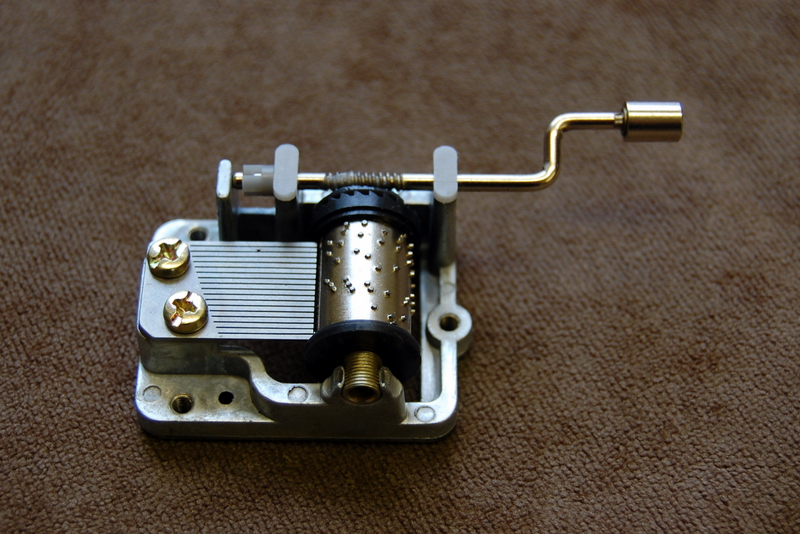 The musical mechanism can be bought from novelty shops quite cheaply. 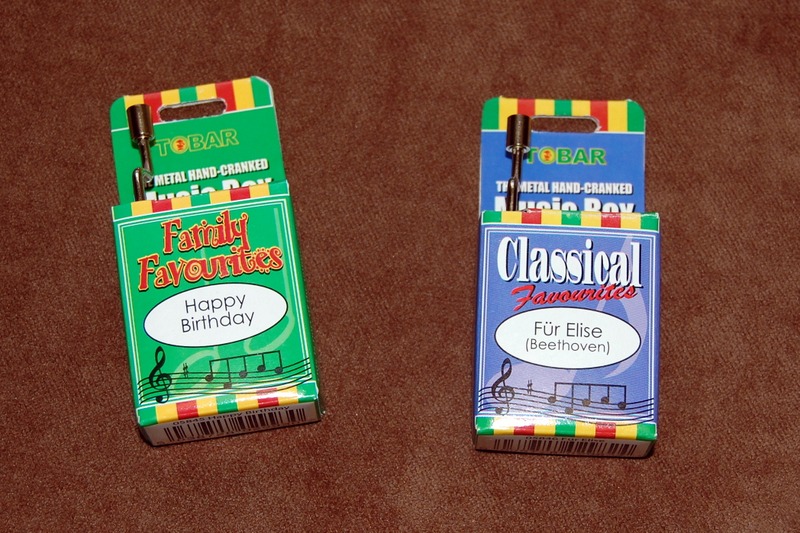 A range of tunes is available of which two are shown below. The mechanism is a steel comb whose teeth are tuned to a scale. Rotating the hand cranked drum causes the raised pimples on it to ‘ping’ notes as they first bend a tooth and then release it. Held in the hand, turning the handle produces a tune so quiet as to be almost inaudible. But pressed against something that can itself vibrate – even a table top or a wooden box – the volume of sound is substantially increased. If you go to the trouble of mounting the mechanism on a thin plate of spruce (I simply glue it with a little epoxy), the sound is really quite loud. 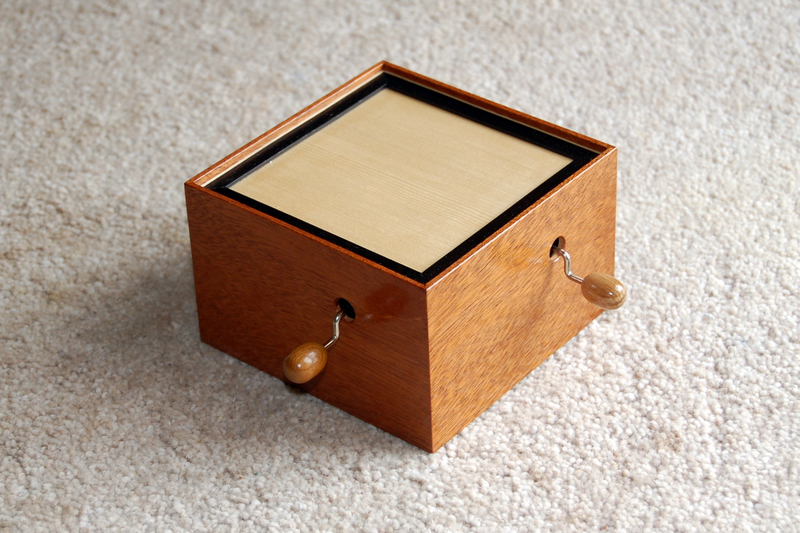 Here’s one in a walnut box. 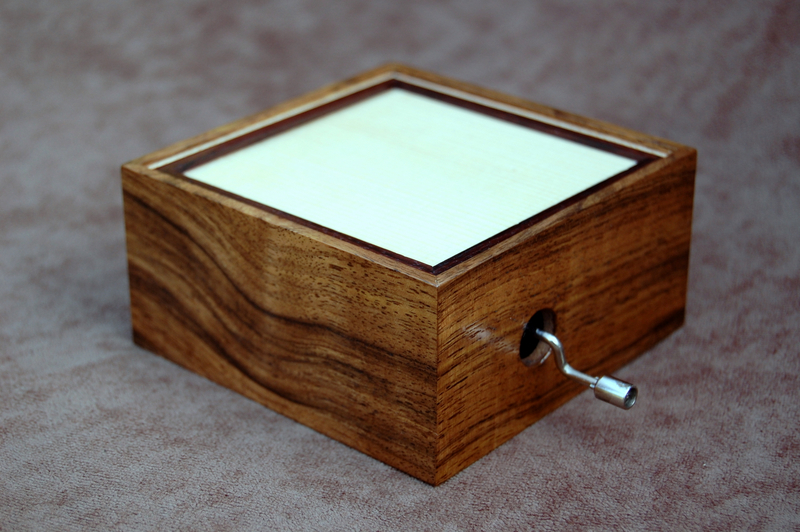 The mechanism is mounted upside down beneath the top and hidden inside the box so that only the handle protrudes. 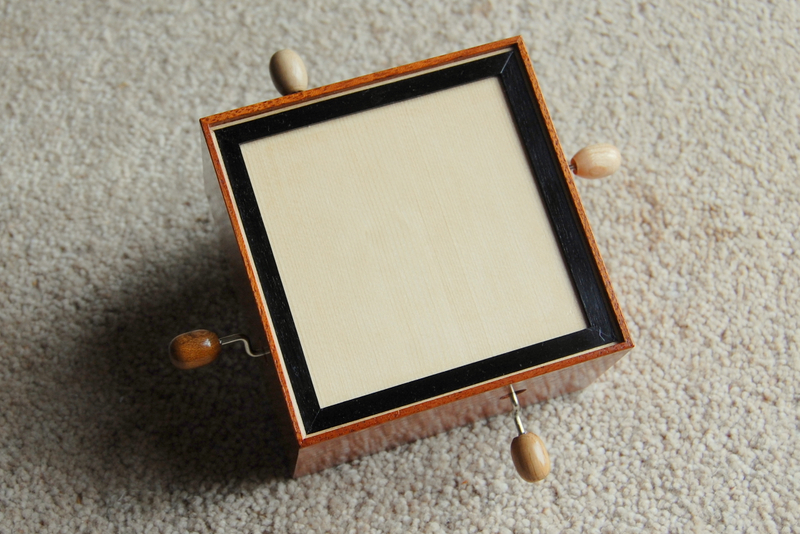 And two views of another, this time with four mechanisms each playing a different tune. 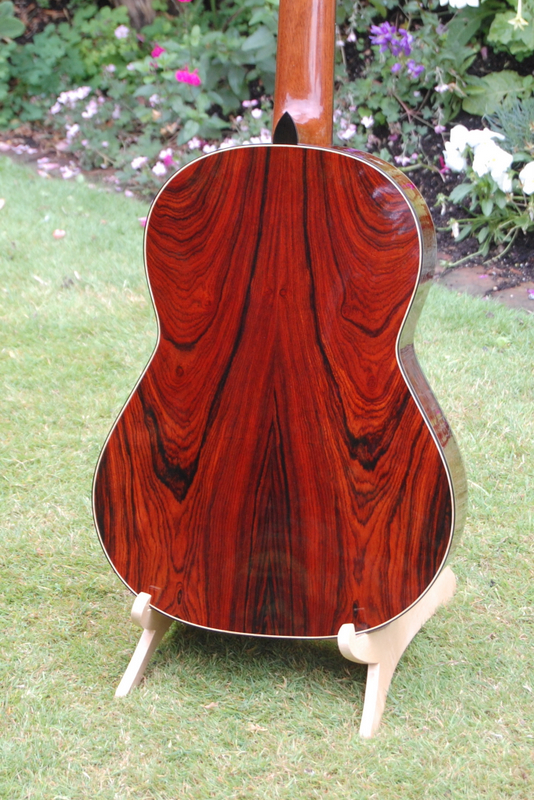 This guitar is now completed and is due to go off to its new owner next week. Since I’ve written so much about making it, it seemed worth posting some pictures of it in its finished state. There are a few more in Gallery too. 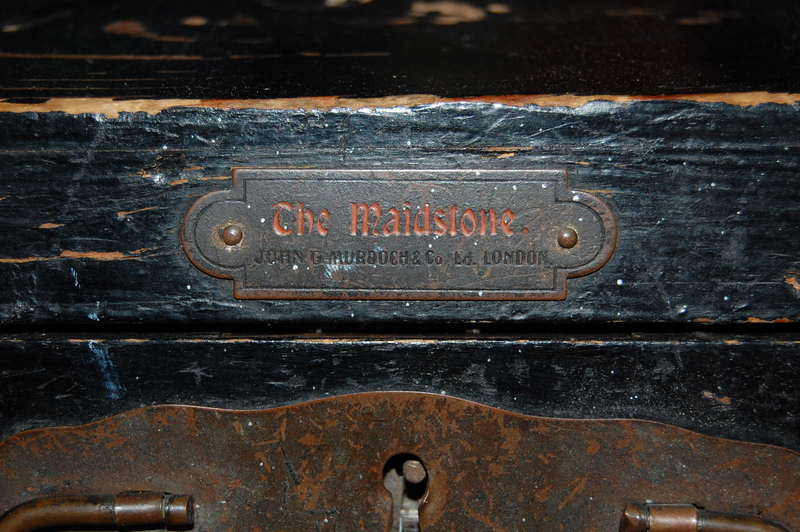 The Maidstone violin that I wrote about in my last post has found a new home. A young violinist friend, who has grown out of the half-size instrument that I made for him a few years ago, came around to see it at the weekend and liked it enough to take away to try it out properly. 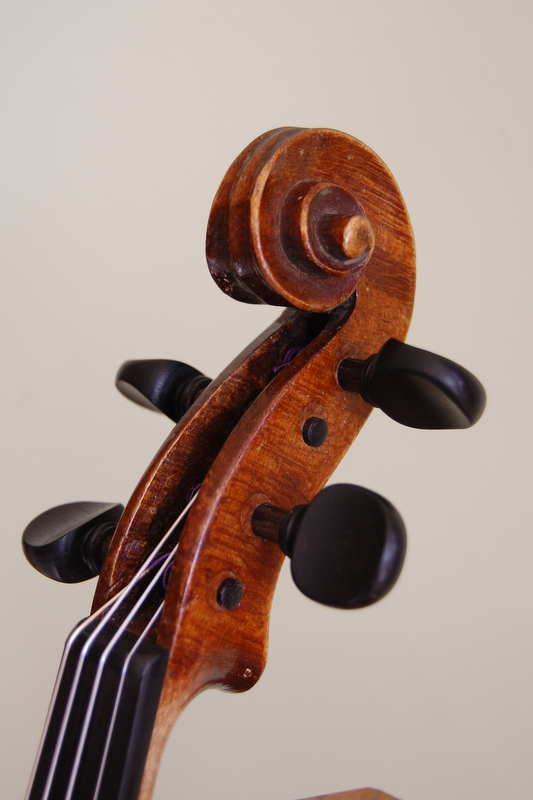 If the speed with which he adapted to the new string length, and the good sound that he got out of it, are anything to go by, it will suit him well until he needs a full-size instrument. It’s rather pleasing to think that this abandoned fiddle may have a second lease of life making music again. 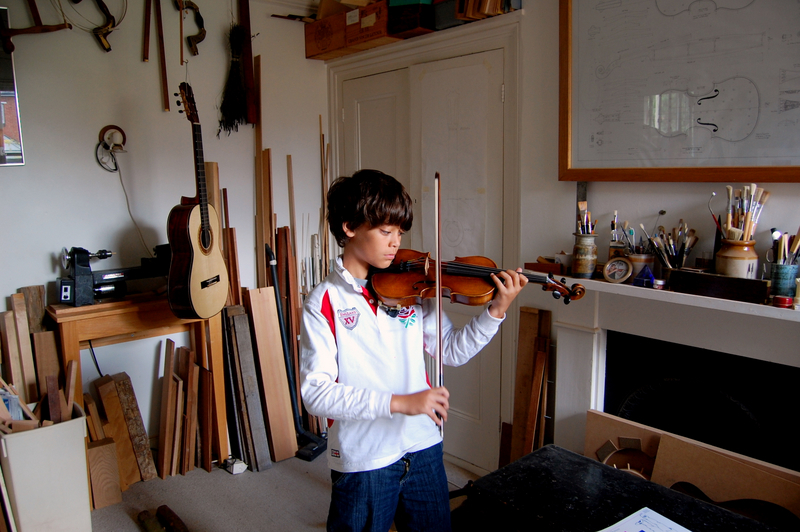 Here’s the violinist, trying it out in my workshop. 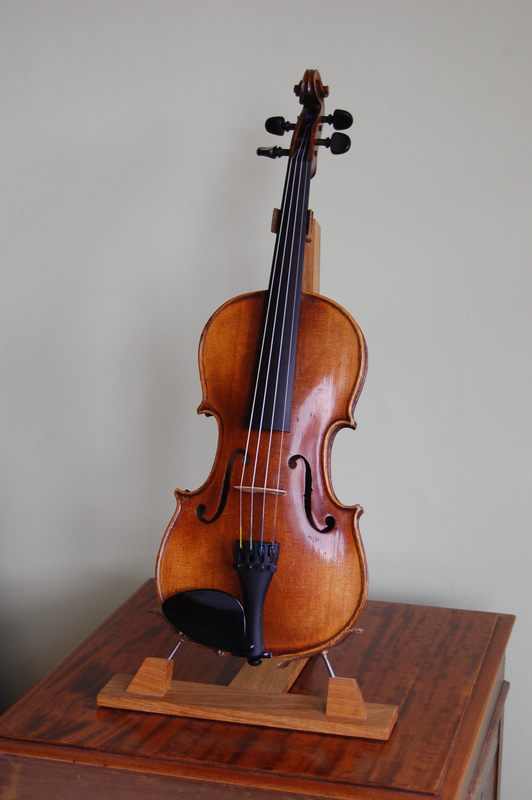 A couple of years ago, I was given a three-quarter size violin in an old wooden case. It was in a shabby state and evidently hadn’t been played for many years. 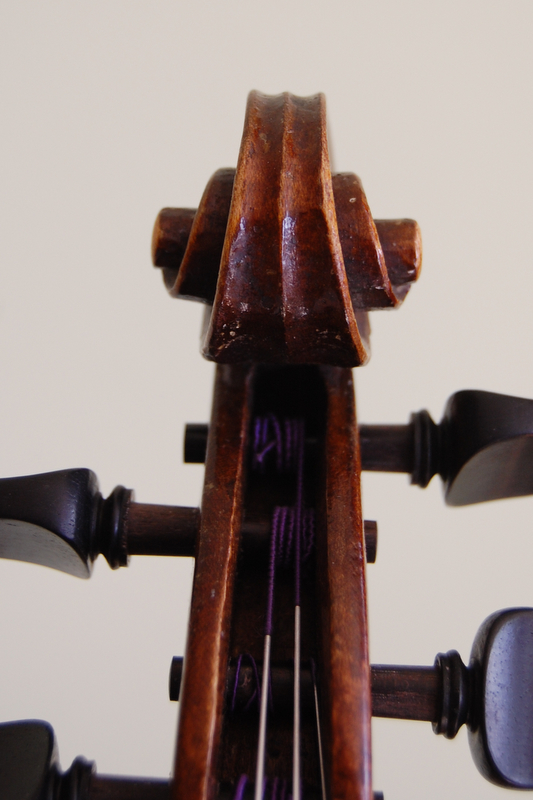 Nor had it ever been a valuable instrument: the scroll and pegbox were crudely carved, the fingerboard and nut were made out of dyed wood rather than ebony and although it had laid in purfling, the job had clearly been done by someone with more concern for speed than accuracy. 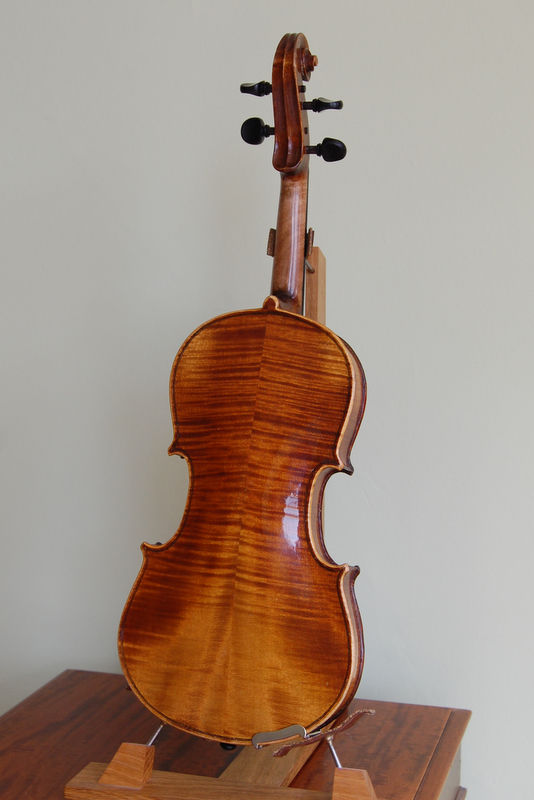 Although restoring this violin made little sense financially, I thought it would be worthwhile – partly for the opportunity to practice repairing skills on an instrument of little value and partly for the pleasure of returning something that had fallen into a decrepit state back to its former glory. 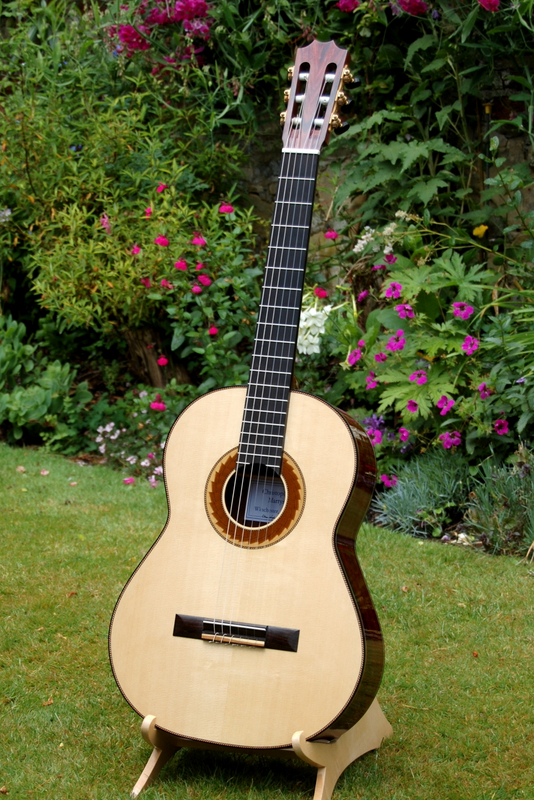 So I took off the fingerboard and substituted a decent piece of ebony, cut out and replaced some wormy wood at the bottom of the pegbox, rebushed the pegholes and fitted new pegs, renewed the edges where they had been damaged and gave it a new bridge, a new soundpost and a new tailpiece. It was an interesting exercise and a rewarding one too, because, when set up with Dominant strings it made a very nice sound indeed. Unfortunately, the shellac experiments failed to reproduce the problem that I had with the polish that failed to harden. I put blobs of shellac from each of the containers of the stuff that I had in the workshop onto a sheet of glass and left them overnight: all hardened satisfactorily. So I can rule out the possibility that the shellac I was using was too old. I also French polished a piece of scrap mahogany, using a lot of mineral oil on the rubber and building up a thickish layer as quickly as I could. That worked fine. So Bob Flexner was quite right when he said that it wasn’t the oil causing the problem. I’m left without an explanation but I have learnt something. First, it’s always worthwhile to check that the shellac hardens using the ‘blob on glass’ technique before starting to polish an instrument. Second, mineral oil is an effective lubricant for the rubber and doesn’t compromise the quality of the finish. And third that, if the polish doesn’t harden fairly quickly, the best thing to do is wipe it off and start again rather than waiting around in the hope that it will harden eventually.